Concert club was originated in New Zealand and expands all over the globe. Anyone can be in the club, but they have to take horrible photos (in my case) or fantastic photos of the event. This latest club gathering was in Rome at the Therme of Caracalla. Neil Young was playing with Promise of the Real, a band headed by Lucas Nelson. The venue was once the bathes for the city and were built around AD 215. So pretty old. The majority of the remaining structures and arches serve as an amazing backdrop for the stage. The gig itself was also amazing. Neil came out to start the show by himself and played on either the piano or his acoustic guitar for a few tunes before the band came on to join for the remainder of the show. I was thoroughly impressed in Neil's playing and how good he and the band sounded. He also played non stop for three hours! About half way through the show Neil brought out Lucas Nelson's father. You my know him. Willie Nelson. Heidi and I were freaking the f out! How could we be so lucky to see Willie in Rome with his sons and Neil Young. Unbelievable. Willie only hung around for a couple tunes, one of Neil's and a perfect rendition of On the Road Again. Most of the people around us didn't have much idea to who Willie was but showed their fanfare for Neil's guest and gave Nelson a huge round of cheer. It was a concert highlight that will stand out in my memory forever. If you know Heidi you know she's a bit of a Wille fanatic. This will stand as her most exciting concert moment ever. She still can't believe Nelson came out and graced us in the most strangest of places, Rome. The show lasted another two hours and Neil rocked out with tons of new material and plenty of fan favorites. What a great way to start the weekend. We're blessed. Heidi and her pet giant raging new trails. Throughout the week the goal was to get a roof rack for the mountain bikes. We have a car that measures about the same length and width of two bikes standing side by side. Perfect for Rome, not so much for putting said bikes into and traveling to ride. After a quick visit to the city center of Rome I found my boy Tommy at a motorini store. He told me he could order the whole set up for me. Crossbars, feet, and two Thule bike carriers would arrive the next day. I've got the time. Next day we head back down and picked up everything we ordered and it barely fit into the car. Good thing its going outside the car. I've put a rack on a car before and this would be a breeze to fit on the car before the weekend. HA! To start, the roof is tiny so finding the right placement for the feet was an exercise in engineering (hearing Owen laughing now). Then I realize we need another kit for the bike trays so they'll fit onto the cross bars. Call Tommy, order more parts, hopefully they work, go pick them up in another day. All in all it worked out. I think we had the rack on and off the roof five or six times before we liked it. The night we finished the job we had plans to be downtown and figured it would all be stolen the first day we had the rack on the car. It didn't and we're happy. Bea and Jolly waiting patiently. 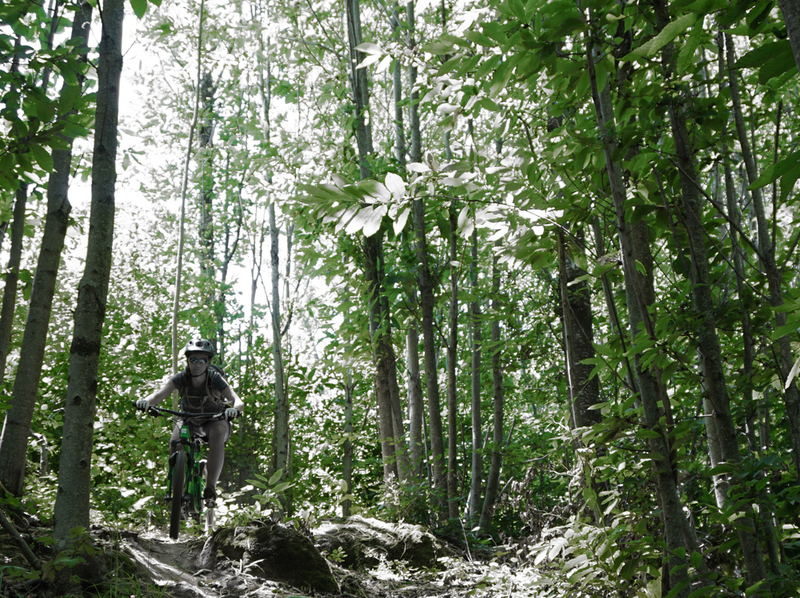 Having a new roof rack and jonesing to ride our bikes in Italy we headed for the closest trails we could find beta on. Saturday we drove about a half an hour to an area just outside Formello to check out some trails. After some expert navigation and smell, we found a place that looked like a parking lot where bikers had started rides. We're getting ready to unload the car and we see another mtn. biker. Thank you mtn. bike gods! The brah spoke english and assured us that where we were headed was the right direction. Then two more bro's show up with full armor on and give us some more beta AND where to go on Sunday for the goods. The riding in Formello was good. All the trials were in a forested area under the canopy with just a little change in elevation. The riding surface was very loose dirt with some rock intermingled to keep it lively. Overall the trails linked up about 10 to 15 miles of track and we ended up riding for a couple hours with some stops for fine tuning and route finding. Being so close to home was a bonus but we'll probably venture a bit further to find some more variety. Our new bike buddy, Censi, in Faggeta. He waited at the bottom of our first lap to get this selfie. Sunday was a whole different ballgame. Our two buddies in Formello sent us to the town of Soriano nel Cimino. A quiet berg north of Rome with a 13th century castle and mountain biking. The biking was located UPHILL of the town off the peak Faggeta del Monte Cimino. Here exists the Gravity Park Faggetta. We somehow found the trailhead but not a signed place to start. So as we walked/gaped around to find a place to start, the mtn. bike gods looked back down upon us and out of nowhere a biker showed up. Censi. He is an ambassador for the area trails and spoke great english. He wished he could have continued riding with us to show us the goods but had other plans. Instead he'd take the time to show us how the trial system worked and where to start. Walking us around for 20 minutes showing us the ins and outs. He insisted we take his phone number and to make sure we call him next time to link up the entire area with shuttles and uphill riding. We rode two laps off the top. One more downhill oriented and one a bit more flowy. Both ended on the paved road that linked up to the trailhead. Each lap required about 4/5km of uphill travel. These trails were similar to what we know and look forward to going back with our guide Censi. After a couple hours of riding in the heat we headed down for some snacks and a beer in town. View of Soriano nel Cimino from the Orsini castle. Mtn. Biking was off the peak to the right.